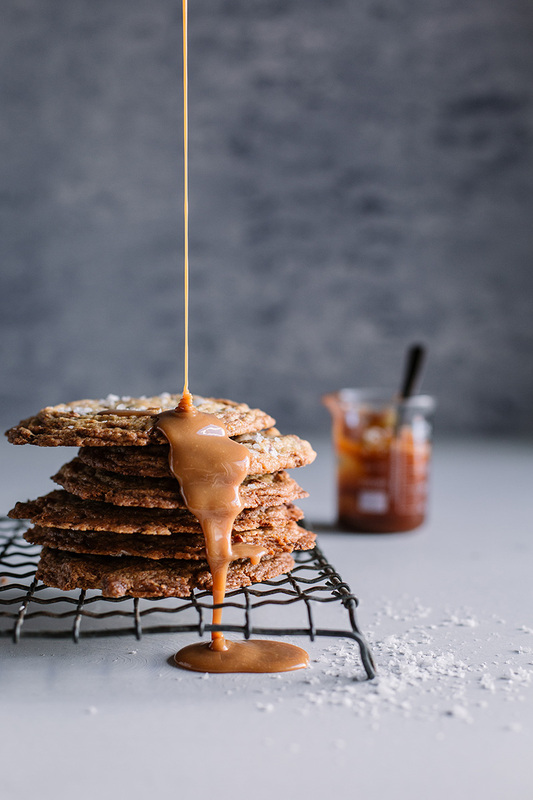 These caramelised white chocolate chip pan-bang cookies are the perfect combination of salty and sweet – they’re also ridiculously good looking! 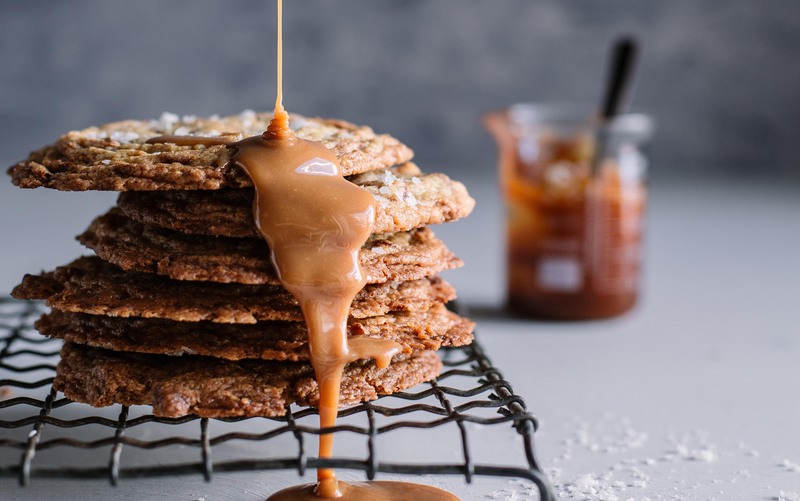 I’ve always admired the work of Sarah Kieffer, from the vanilla bean blog but when she managed to rock the internet with her rippled pan-bang cookies, I fell in love even more. If you don’t yet know what pan-bang cookies are, you may be confused into thinking that they are, in fact, the result of a flop. With crispy lacy edges and a chewy centre, though, these are far from a mutant. 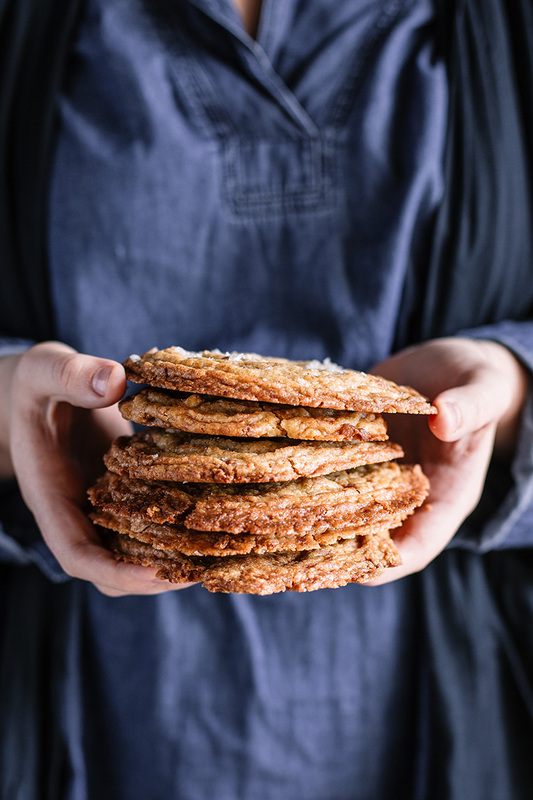 They are a glorious invention and I tend to agree with New York Times food writer, Julia Moskin, that they are a ‘leap forward in cookie technology’. Now that’s a subject I wish I had at school! 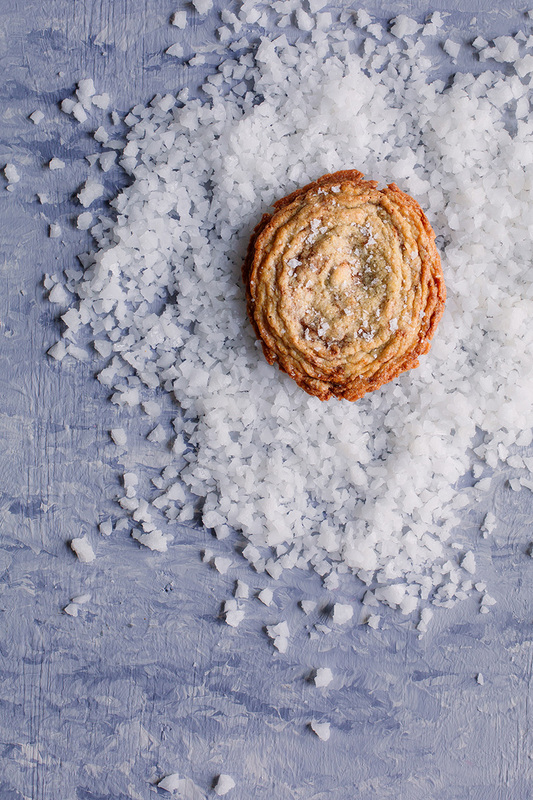 The trick to getting the beautiful ripples in these pan-bang cookies is purposely banging the cookies during baking. 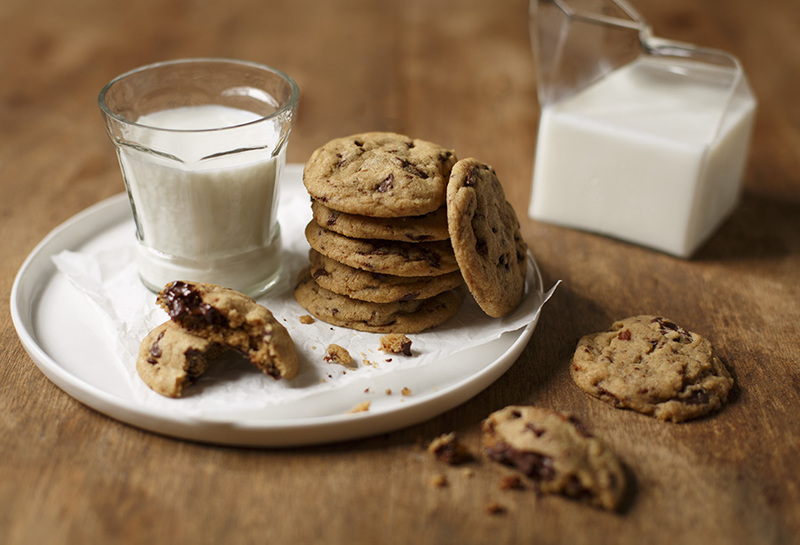 This creates waves of deliciousness that don’t just make the cookies extra photogenic but give the edges extra crunch. I adapted Sarah’s recipe by including chunks of caramelised white chocolate, whole toasted almonds and finished them off with a sprinkling of sea salt. If you’re not a caramelised white chocolate fan (who are you, even!?) 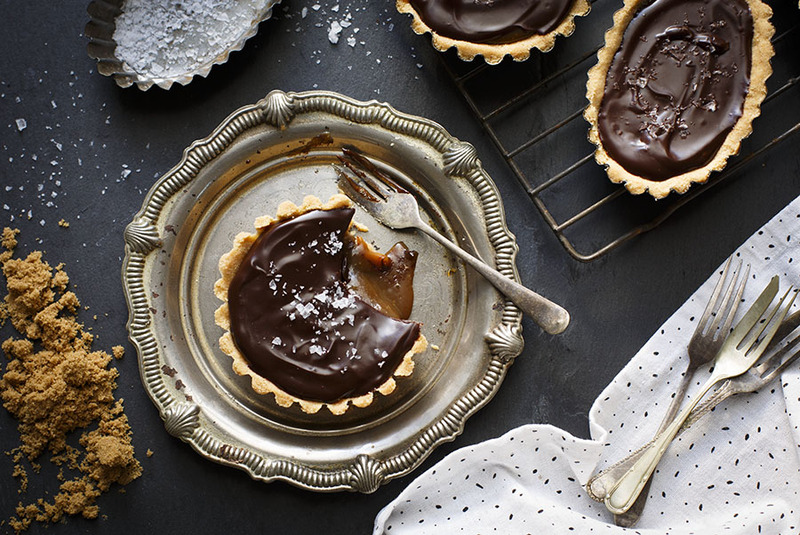 then some really great-quality dark chocolate would be equally sinful in these! Find out how to make your own caramelised white chocolate here. In a medium bowl, whisk together the cake flour, cardamom, bicarbonate of soda and salt. In the bowl of a stand mixer fitted with a paddle attachment, cream the butter until light and fluffy. Scrape the sides of the bowl and add the egg, vanilla and water and mix until combined. Stir in the chocolate, almonds and rolled oats until completely combined. Line 2 baking trays with baking paper. 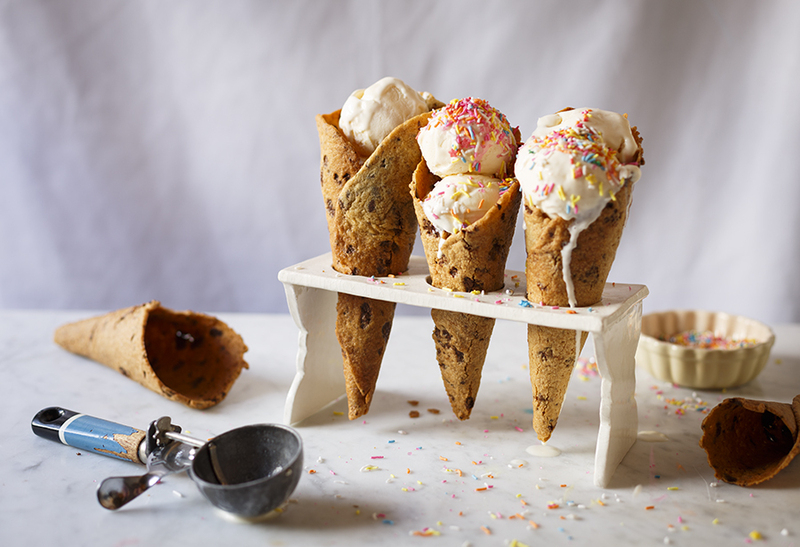 Weigh out 100g balls or use an ice cream scoop to measure out as many balls of dough as possible. Arrange the dough balls evenly between the lined baking sheets (around 5 per tray) and freeze overnight. Bake the cookies for 10 minutes. Just as the cookies start to puff in the middle slightly, lift the one side of tray slightly (about 2 centimetres) and drop on to the rack. This will cause the first ripple to appear, tap the tray on the rack twice more before continuing. After 2 minutes, lift and drop the tray again. Repeat this method a few times so you have a few rippled lines on the cookie. The cookies bake between 16-18 minutes in total or until they are fully spread out and the edges are golden brown. Repeat this process with the second tray, and cool the cookies on a cooling rack. - The cookies are rather large, but in order to get the perfect ripple you need them to be large. If you make them smaller you won’t get the same effect. - If you don’t freeze the cookies beforehand, the cookies will spread out too much and you won’t get that desired ripple. - Baking them on the dull side of foil, makes the bottom of the cookies, nice a crispy and golden brown, but normal parchment paper also works just as well. Hi Judy! You’ll see at the end of the post I’ve included a link to how you can make your own. 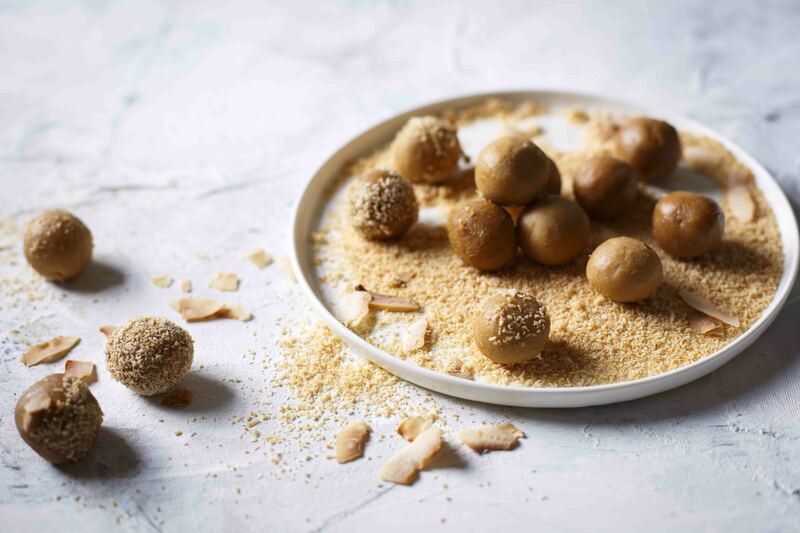 At the moment, we don’t get a good-quality caramelised white chocolate in South Africa but it’s SO easy to make – and SO worth it!